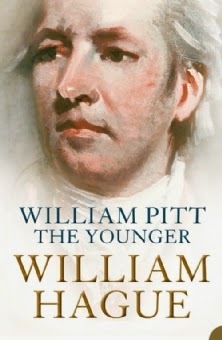 Before taking office as the present Foreign Secretary in the Coalition Government in the UK, but after he had ceased to be Leader of the Opposition, William Hague wrote a major biography of a Prime Minister of an earlier era, William Pitt the Younger. It was first published by Harper Collins in 2004. Pitt, whose father had been Prime Minister before him, became Prime Minister in 1784 at the age of 25 and held that office almost continuously until his early death in 1806. How did Pitt manage to become Prime Minister at the age of 25, something that would hardly happen today despite all the emphasis on the supposed youthfulness of our popular culture? At the time, a person could only become Prime Minister if he had been nominated by the King (George the Third), and the King was determined that the other viable candidate for the job, Charles Fox not get the job. Pitt had the advantage of being the son of a former Prime Minister, and was already a member of the small aristocratic circle who formed the “electorate” a potential Prime Ministers had to satisfy in those days. These were all people who knew Pitt personally and did not have to rely for their information about a person’s suitability for office on sound bites, as an electorate must do today. Politicians generally were younger in those days, many the sons of people who had to vacate their seats in the House of Commons on taking their father’s seat in the House of Lords. Pitt had spent much of his childhood honing his oratorical skills and observing his father’s work as Prime Minister, so he was better prepared for the job that his years might suggest. William Hague’s biography of Pitt is thorough and well written, running to almost 600 pages. It brings out the extent to which mastering the House of Commons by the power of oratory was crucial in those days. Equally important was keeping on good terms with the King, and it was the King’s visceral antipathy to Pitt’s rival Fox, that sustained the King’s confidence in Pitt over such a long period. Interestingly, the King’s heir, the Prince of Wales, was a strong ally of Fox and if he had came to the throne earlier, Pitt would have lost office quickly. Pitt also had to make many compromises to keep the King’s confidence. He was a supporter of allowing Catholics to sit the House of Commons ( so called Catholic Emancipation), the reform of Parliament to broaden the franchise, and the abolition of slavery . But the King was not in favour of any of these things. So Pitt accomplished none of them during his long period in office. His liberalising instinct were also tempered by the forces released by the French Revolution, which threatened to overthrow the entire propertied order throughout Europe. Pitt was the Prime Minister responsible for pushing through the Union of the Irish and British Parliaments in 1800. He had recognised early on that British trade and shipping policies were artificially depressing the Irish economy to benefit British interests and tried in the 1780’s to remedy this by promoting free trade between the two islands. This was frustrated because of opposition from commercial interests in England. He promoted Union between the two islands partly to get over this. He had also hoped that Catholic Emancipation could be more easily conceded in a UK context, where Protestants would not be so likely to be outnumbered, as they would have been in a separate Irish Parliament. But, after the Act of Union, he failed to promote Catholic Emancipation because of the opposition of the King. He resigned in protest over this but was soon back in office and dropped the matter thereafter. Pitt never married, and worked prodigiously hard all his life. He had to do so because he combined the present day offices of Prime Minister and Finance Minister, as well as doing the energy sapping work of mastering a highly indisciplined parliamentary majority. His main recreation was consuming copious amounts of port, which contributed to his early death from what was probably an ulcer.